Engin why did you decide to pull with Mindaugas? – I decided to pull Mindaugas because I felt I could beat him but lost because of some unlucky situations. One of these was me to be 65 kg only some weeks before the Zloty Tur and I believe I did not recover enough for Mindaugas. Another reason was I spent a sleepless night day before him. And the last thing was I met Mindaugas on first round and went to B side with 2 fouls while I was in better position. I went to B side and had to pull a lot of matches before reaching the final. Because of my age and injuries, it also was a disadvantage. I was so close on winning anyways and if I am right about any of these thoughts then I have chance to win against him. How did you not lose your shape after Zloty Tur? What about your weight? – After deciding to pull Mindaugas again I had to continue training and that is how I kept the shape. When I was young and healthy I was ready to pull any day of the year but now because of injuries and slow metabolism it’s hard to be in shape all the time. Especially losing weight is a big problem as I quickly become fat. I train as I always train. Also some specific trainings at the table especially against Mindaugas. I know what I need to do to beat him but will I be strong enough? That is the question. My weight is problem, I have 4,5 kilos to lose as of now that is 12 days to the event. What’s at stake? Title? Rating points? Or you just want to know who’s strongest? – Beating Mindaugas is nothing about title or point, neither checking who is the best. I think it is mostly about answering a question that has been on my mind, which is “Is he really better than me or it was a result of that day with some unlucky situations?” He is a great puller and I have respect for him no matter the score of the upcoming event. There’s nothing personal. He is just an overconfident outspoken guy, and I really enjoy as long as we keep it respectful. He is also smart guy and I see this also as a battle of the minds. He is smart on and off the table, and I enjoy this battle. We kind of ended the battle off the table and waiting for the actual battle on the table. 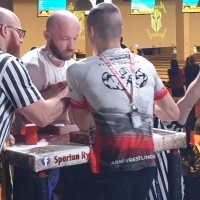 Are you really going to quit armwrestling? Why? What do you need to keep pulling? – I will never pull as an average guy, if I pull I need to pull to target the top. In the past the price of this was not as heavy as today. I was young and metabolism was fast. I was ripped and did not have to lose so much weight all the time. Now I make weight and 2 months later I gain 15 kg fat on my belly and legs mostly. So I do cardios and strict diets. I have serious neck problems and when I do heavy cardios and diets because of sudden weight losses it becomes worse. My neck and back hurts more and more. Also I am hurt all over arms as well. All the time I need different therapies to heal injuries. So this weight loss and injuries are the biggest problems. I can handle the injuries as I learnt how to live with it but weight loss bothers me the most. I think I want to eat whatever I want but the result is a nightmare. Between 2016 June and 2017 June I quitted armwrestling and I was 92 kg first time in my life. If I can keep my weight in control, then I may continue pulling but if I pass 80kg again then I don't think I will have motivation to lose the weight. Time will show. You told a lot to each other but… Do you have something to add? – There is nothing more that I will tell to Mindaugas untill February 9.